Furla debuted a trio of eco-friendly bags to celebrate Earth Day. The front of each bag can be personalized with a name or a message (where the light green fabric is placed). Imagine all the profound threads you could appose to the designer accessory! Also note that the customisable bags were produced with an energy-saving tanning process called "Wet White"! This tanning technique allows the leather to remain completely biodegradable. I thought you might want to know that although, you'll never want to part from them let alone trash them! So, take part in the celebration and in this life long quest towards a cleaner world. But, remember: if their green appeal is not enough to convince you, you can still buy them simply because they're Furla! 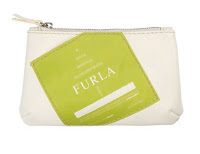 Visit Furla.com for list of shops.